This post is Part 1 of a series about Minbari, a second map commission for science-fiction writer Stephen Everett. After Steve and I collaborated on his first map of Sheridan's World, Steve connected with me for a second map of the same planet. 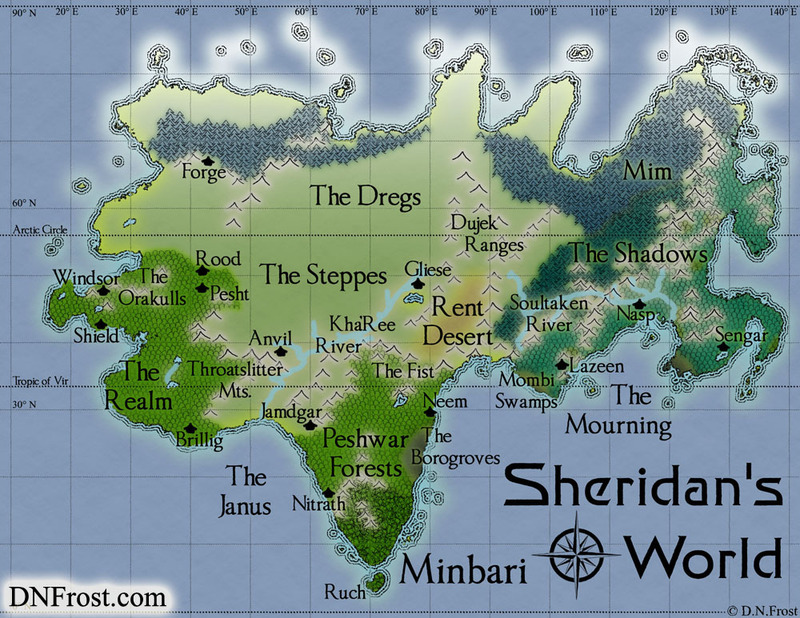 This time, we'd be mapping Minbari, a longer and skinnier continent on the other side of Sheridan's World. For this map, Steve had some specific coordinates for the limits of the Minbari continent, but fewer towns with exact coordinates. We discussed his basic needs for the map, and I sent Steve an estimate based on the streamlined style of his first map. Shortly after he signed the estimate, however, Steve mentioned including more topography like forests and rivers. Since the estimate hadn't accounted for the additions, I noted the new features he wanted. As a repeat customer, Steve understood the difference between the map elements I'd factored into his estimate and the map elements he brought up afterward. Once I knew Steve was fine with the extra cost of his topography additions, I used a rough sketch he'd sent me to make an initial render of his coastline.